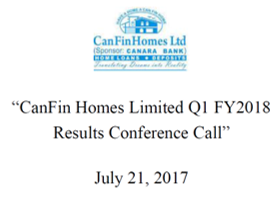 This quarter was one of the best quarters in terms of numbers i.e., the NIIs, the PBT, the PAT, the NIM, the ROA, the ROE all the numbers are best ever posted by CanFin. 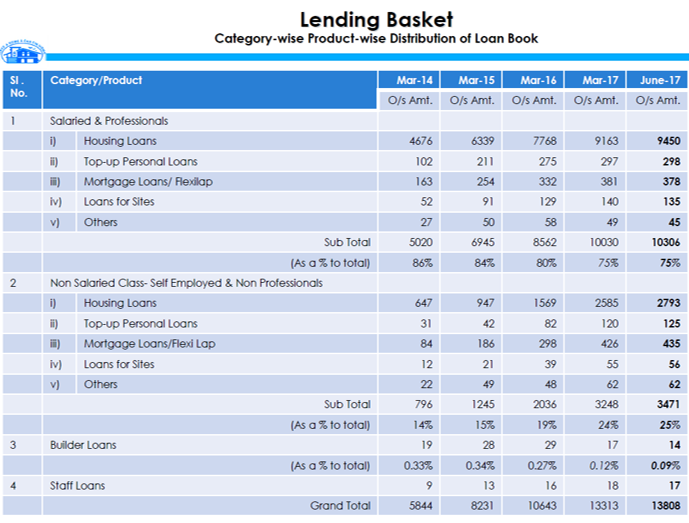 In Q1 the loan book growth has been 23.5%, surpassing the 13,800 Crore loan book that was planned for Q1. Earnings have increased by 29%, expenses have increased by 12% resulting in NII improvement by 34% to 123 Crores, which is a resultant of the loan book growth of 23.5% coupled with the cost of funds. Cost of funds were down by 82 basis points yoy. Yield on advances has dropped 32 basis points. Margins have improved to 3.65% compared to 3.39% a year ago. Margins have dropped 26 basis points sequentially compared to March 3.54% where it was 11 basis points, the margins have gone up. Cost income ratio has added 34% to the NII growth. Cost income ratio is registered to be best ever of 14.90 compared to 17.02 of Q4 and 17.8 for the previous Q1. PBT has gone up by 42% at 111 Cr and the PAT is 71.22 Cr. Sequentially, it is almost a bit above the Q4 of last financial year, considering yoy there is a 43% increase in PAT. The ROA has gone up to 2.11%, crossing 2% mark for the first time, it was 1.84% in the corresponding quarter of previous year and it was 1.97% in March just below the 2% mark. ROE has gone up at 25.54, with an increase of 3.88% compared to 21.66% to the previous year. Capital adequacy is 19.17%, improved due to higher earnings being ploughed back and Tier I it is 16.7%. Average business per branch and per employee has improved with per branch business going up to 102 Cr. Currently business going up to 23.5% Cr, which was around 18.5 during the previous year at this time. 100% of the book is backed by mortgage, so the decision to invoke the SARFAESI has been made. 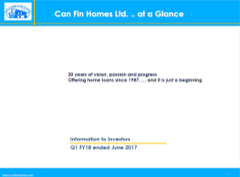 Canfin primarily is into individual housing that is 88.5% is housing and around 11.5% is non-housing with the average ticket size continuing to be around 18 lakhs and 9 lakhs. 95% of the loan approvals are in the income range of redefined affordable housing i.e. up to 18 lakhs annual income, in that up to 6 lakhs, the LIG segment constitutes around 53% and around 42% in MIG segment. Disbursements compared to last year sequentially if you see Q4 and Q1 of current year, Q4 of last year the disbursements had slumped, for the quarter it had slumped to 3% yoy increase, Q4 of FY 2016 and Q4 of FY 2017 the growth was 3%, current year it is 10%, Q1 of FY2018 is up by 10% compared to Q1 of FY2017. Loan book growth in Q4 FY2017 was negative 16% compared to Q4 FY2016, now the gap has been breached and there is a positive. Sanctions and disbursements are both slow compared YoY is due to enactment of the RERA. Q4 had partially faced impact of demonetization as there was two months moratorium given to the HFCs for the months of November and December. Asset quality continues to be top priority. Q1 has witnessed some deferred impact of the two months moratorium and that was in November, December post demonetization with another big component that was Section 269ST regarding the 2 lakh limit on cash transaction. Net NPA is 0.17% compared to 0.04 in previous June and the provision coverage is lower coming up at 55% in terms of NPAs cost. The NPAs from 188 accounts is amounting to 29.5 Cr as in March for recovery in Q1 so it gives the company nine months period to get this account off the books. Overall yield of the company has been around 10.59% and only 10% of the incremental is for non-housing, and around 12.5% to 13% on non-housing. This is the average of the entire book. Rate of borrowing is on an average 7.84% compared to 8.65% in previous June, last financial year it was 8.35%, showing a substantial dip due to new base for Q1, it is 7.84% of the incremental cost of borrowings for CanFin. The spreads have gone up from last year’s 2.61% to current spread which is 2.75%. Marginal yield has come down from 10.96 to 10.59 and the cost has come down from 8.35 to 7.84. This is compared to the last full year and current year first quarter. 7200 loans have been disbursed this quarter. 95% of the sanctions qualify in the affordable segment. Of the total housing, individual housing that has been lent, of which 95% is in the income range up to 18 lakhs and 53% is in the range of up to 6 lakhs that is it may be within the range of 3 to 6 lakhs. CLSS has been applied wherever applicable as for CLSS income is not the only criteria. Six branches and head offices have been added this quarter. 11 branches and 10 satellite offices have already been approved which leaves six more satellite offices and five more branches to go. 21 new outlets have been planned to be opened during the year out of which 10 have been opened in Q1 itself. Cost to income ratio has dipped a little due to the above expansion strategy. Stock split is linked to the postal ballot which is expected to be there in the Q3. Interest rates for existing loans cannot be reduced as the interest rates have been allotted based on the risk rating, for which the borrower needs to pay the risk premium. 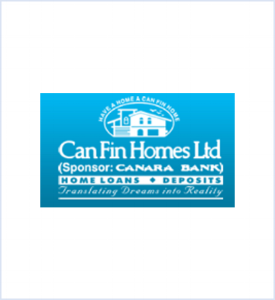 CanFin is the first HFC, which has gone for an annual resetting mode. Interest rates will be reset annually based on the risk category. The subsidy received through CLSS will be transferred to the customer’s account resulting in the reduction of loan amount and EMI. Loan origination from resale and self-construction ranges from 9% to 12%.